Velaiilla Pattadhari 2 (English: The unemployed graduate) is a 2017 Indian action-comedy film directed by Soundarya Rajnikanth. The film was shot simultaneously in Tamil and Telugu, with the latter titled VIP 2. It is a sequel to the 2014 film Velaiilla Pattadhari and has Dhanush, Amala Paul, Vivek, Hrishikesh, Saranya Ponvannan, and Samuthirakani reprising their roles, while Kajol plays an antagonistic role in her second Tamil film after 1997's Minsara Kanavu. Dhanush, besides acting, also co-produced with N. Ramasamy, and wrote the story and dialogues for the film. Its music was composed by Sean Roldan. It was released worldwide on 11 August 2017, after initially planning to release on Dhanush's birthday, July 28. The film was originally shot in Tamil and Telugu, while being dubbed into Hindi, with Dhanush rendering his own voice for the Tamil and Telugu versions. The film was later dubbed into Hindi as VIP 2 - Lalkar. 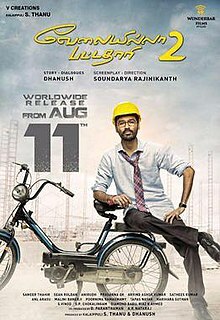 The film opens two years after the events of the first film, with Anitha Constructions Civil Engineer Raghuvaran (Dhanush) winning the Civil Engineer of the Year 2016 Award and is an executive member of his company now, along with a parking spot. His wife Dr. Shalini (Amala Paul) becomes an authoritative, nagging wife who controls him. She has resigned her job to take care of the household, after marriage. Raghuvaran is also dismissive about his wife getting another job. Raghuvaran efficiently completes construction projects assigned to him, with the help of about 200 unemployed young civil, mechanical and electrical engineers, who are his friends. Vasundhara (Kajol), a chairman of a big construction company in South India, Vasundhara Constructions, witness the announcement of Raghuvaran's victory at the Engineer of the Year 2016 Awards and finds out about him. She makes Raghuvaran a job offer, but he humbly refuses, having been interested in creating his own construction company, VIP Constructions. Later, Raghuvaran's project team and Vasundhara's top team are invited at the same time to exhibit their models for a proposed private medical college and hospital building to a very rich and native trader. Vasundhara exhibits her project with heavy pride and ego, while Raghuvaran explains his project in a simple manner. The trader gives the project to Anitha Constructions. Raghuvaran provides some polite advice to Vasundhara outside the building. This offends her, and she begins to go after him, placing one obstacle after another. First, she uses her influence in the state cabinet to force the trader to give the project back to her. She then makes counter=bids to all of Anitha Construction's projects at a lower price, causing the company to lose their own projects. Raghuvaran learns of this and quits his own job just to save his first company. He is approached by the son of a Delhi-based construction mogul, with an idea of starting a new construction company with 50-50 shares. Raghuvaran agrees by putting his house under mortgage of five million Rs and starts "VIP" Constructions with the 200 unemployed engineers as the company's employees. They don't get to start projects for a month. Due to a word of mouth, they get an offer from Prakash (Saravana Subbiah), a greedy businessman who wants to build a theme park in a marshy land. Raghuvaran's gang gets excited, but the soil tests prove them wrong. So, they decline the project. Prakash bribes an executive member of Vasundhara Constructions and makes her start on the same project. Raghuvaran's team starts a protest, and a statewide uproar causes the project to be stopped by the government. Prakash is caught up between various lawsuits filed across the state. This causes a bad name and a loss of projects to Vasundhara Constructions. To eliminate Raghuvaran, she targets his company. She anonymously buys the 50% shares held by Raghuvaran, when it is legally up for sale to create funds. Raghuvaran is fired from VIP Constructions by Vasundhara, causing the employees to quit their own jobs immediately. That night, Prakash sends goons to kill Raghuvaran, but Raghuvaran beats them all up. He thinks that Vasundhara had sent them and goes to her office room in her company's main headquarters building. Vasundahra is alone in the building, as she is currently thinking about the loyalty of all the employees of VIP Constructions towards Raghuvaran. Raghuvaran initially berates, then advises Vasundara, and starts to leave. Unfortunately, the office is flooded due to heavy downpour, and they are trapped in their floor. They then cooperate to find biscuits and wine in the top floor. Due to their conversation, Vasundhara understands her mistakes and becomes friends with Raghuvaran. The next morning, Raghuvaran brings Vasundhara to his home to introduce her to his family, while both come to a deal to no longer quarrel with each other, to be business partners, and run VIP Constructions together. After their 2014 film, Velaiilla Pattadhari, Velraj and Dhanush worked on the production of Thangamagan (2015), which was initially widely reported to be a sequel to their previous film. During the production stages of the film, Dhanush denied that this was the case and confirmed it was a different script. Later, in mid-2016, Dhanush's sister-in-law, Soundarya Rajinikanth agreed to terms with producer N. Ramasamy and Hema Rukmai to make a romantic drama film titled Nilavukku Enmel Ennadi Kobam and cast Dhanush in the lead role. Despite negotiations with actresses including Sonam Kapoor, Kajal Aggarwal and Manjima Mohan, the project failed to materialise, and in a sudden turn of events, Dhanush revealed that he would instead collaborate with Soundarya for a sequel to his earlier film Velaiilla Pattadhari. The film was revealed to be co-produced by N. Ramasamy, while the latter would also write the script of the film. Sean Roldon was signed to replace Anirudh as the film's composer, while the theme music composed by Anirudh was retained in the new project. During the launch event of the film, it was announced that Sameer Thahir would work as the cinematographer, while Prasanna GK would be the editor. Casting for the film began in late 2016, with several members of the original cast, including Amala Paul, Samuthirakani, Vivek and Hrishikesh retained for the sequel. Saranya, whose character died in the first film, was also selected to portray a role. Hindi film actress Kajol was also selected to play a pivotal role in the film, which marks her comeback in Tamil cinema after nearly 20 years. Production on the film began on 15 December 2016, with actor Rajinikanth in attendance at the launch event in his family's Poes Garden home in Chennai. The team filmed a promo song in Mumbai, choreographed by Bosco and Caesar. Filming ended in April 2017. The film was originally planned to release on 28 July 2017, coinciding with Dhanush's birthday, but was postponed to 11 August 2017. The Hindi version of this film was released on 18 August 2017 and Telugu version was released on 25 August 2017. The satellite rights of the film's Tamil Version were sold to Sun TV. The film's Hindi version's satellite rights were sold to Star India. The soundtrack was composed by Sean Roldan. The tracklist featuring five tracks was released on 25 June at Mumbai. Some themes that were highlights of the characters and title were retained from the first film, composed by Anirudh Ravichander. ^ "2014: When little gems outclassed big guns in southern cinema". Hindustan Times. IANS. 19 December 2014. Archived from the original on 21 December 2014. Retrieved 21 December 2014. ^ "VIP 2: Kajol's comeback Tamil film will release on Dhanush's birthday". 7 May 2017. ^ "Dhanush clarifies on VIP 2". Timesofindia.indiatimes.com. 20 March 2015. Retrieved 24 December 2016. ^ "Soundarya Rajinikanth joins hands with Kabali producer, announces second film". The Indian Express. Retrieved 24 December 2016. ^ "Sonam Kapoor and Kajal Agarwal in talks for Soundarya Rajinikanth film". Behindwoods.com. 13 October 2016. Retrieved 24 December 2016. ^ "Soundarya Rajinikanth to direct Dhanush in VIP 2". The Hindu. Retrieved 24 December 2016. ^ a b "VIP 2 shooting begins, Kajol to feature in a prominent role". The Hindu. 16 December 2016. Retrieved 24 December 2016. ^ "Saranya Ponvannan on her role in Dhanush's VIP2". Behindwoods.com. 16 December 2016. Retrieved 24 December 2016. ^ "Confirmed: Kajol to act with Dhanush in Velai Illa Pattathari 2 : PTI feed, News". Indiatoday.intoday.in. 15 December 2016. Retrieved 24 December 2016. ^ "VIP-2 starts rolling". Sify.com. Retrieved 24 December 2016. ^ "VIP-2 shooting kicks off". The New Indian Express. 4 January 2017. Archived from the original on 2 April 2017. Retrieved 21 March 2017. ^ "Rajinikanth launches Dhanush-Soundarya's VIP2, see pics". The Indian Express. 15 December 2016. Retrieved 24 December 2016. ^ "Rajinikanth gives blessings to Dhanush for 'VIP 2'". The New Indian Express. 15 December 2016. Retrieved 24 December 2016. ^ "Dhanush and Kajol shake a leg". www.deccanchronicle.com/. 21 May 2017. Retrieved 21 May 2017. ^ "It's a wrap for Dhanush and Soundarya Rajnikanth's 'VIP 2'". Daily News & Analysis. 2 April 2017. Retrieved 24 July 2017. ^ "VIP 2: Kajol says she was a bit 'apprehensive' about speaking in Tamil". www.hindustantimes.com/. 11 May 2017. Retrieved 21 July 2017. ^ "Velai Illa Pattadhaari 2 release postponed". Top 10 Cinema. 20 July 2017. Retrieved 21 July 2017. ^ "Dhanush clashes with Ajith Kumar now". Top 10 Cinema. 16 August 2017. Retrieved 16 August 2017. ^ "Kajol, Dhanush at VIP-2 audio launch". Archived from the original on 26 June 2017.